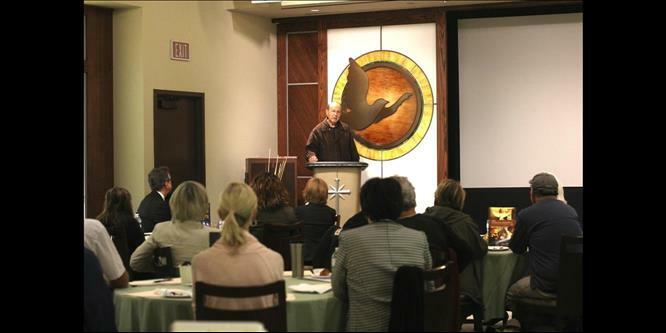 (MENAFN - Newswire.com LLC) PASADENA, Calif., December 20, 2018 (Newswire.com) - In honor of Human Rights Day , the Church of Scientology of Pasadena hosted an open house to raise awareness about human trafficking. This basic violation of human rights, the crime of slavery, is a major problem in cities across the U.S. In fact, those attending came to realize it is not only one of the worst human rights violations, it is also very close to home. The Open House commemorated the 70th Anniversary of the Universal Declaration of Human Rights, (UDHR), drafted by a committee chaired by Eleanor Roosevelt and adopted in 1948. The purpose of the forum was to educate the community on how to detect and speak up when they see indicators of human trafficking. It featured the educational materials of United for Human Rights and Youth for Human Rights International, Scientology-sponsored campaigns that raise awareness about human rights and human rights violations. Guest speaker Mr. Nat Nehdar, Pasadena Human Relations Commissioner, voted Pasadena Citizen of the Year in 2005 and again in 2015, gave details of how traffickers establish an online relationship using social media to lure victims. He gave an account of a local girl who fell victim to a scheme: a would-be "employer" had her fill out a specious job application which included her address and the names and addresses of her family. When she arrived to start work, the trafficker trapped her by threatening her family. Nehdar stressed that parents need to establish close communication with their children and make them aware of this issue and how to protect themselves. He covered how to speak to children about this subject. A survivor shared the gruesome story of her life as a victim of human trafficking and how she saved herself and her two young children from this horrendous and dangerous situation. Her emotionally charged tale began when she was 13 and ended 17 years later with the birth of her twin boys and her escape. She is now making a new life for herself and her family and sharing her story to educate others. 4) where to report it. The audience wanted to know more about the subject and what they can do personally to stop this gross violation of human rights. "I am glad to have been awakened on the subject," said one guest. "I didn't realize that it was happening here and not just overseas. It is definitely something that needs to be brought to light and stopped." "I feel a bit like I've been living in a cocoon, not realizing how close to home human trafficking really is," said another. "This event and the speakers opened my eyes, and I intend to find out ways to spot instances of human trafficking and report them." The Open House focused on the importance of educating people on the Universal Declaration of Human Rights: Only those who understand these rights will demand that their governments implement them. In 1969, Scientology Founder L. Ron Hubbard wrote, "Very few governments have implemented any part of the Universal Declaration of Human Rights. These governments have not grasped that their very survival depends utterly upon adopting such reforms and thus giving their peoples a cause, a civilization worth supporting, worth their patriotism."